Where can I buy an old postbox? What can I buy from your Museum shop? Until 2003, it was possible to buy redundant boxes direct from Royal Mail. However, with the adoption of a blanket "listing" policy jointly by English Heritage and Royal Mail, the process was halted. Today, boxes are either re-sited, scrapped or stored for further use. In special circumstances, a box may be donated to a bona fide museum if no further use can be found for it. Today the best places to find old boxes are in reclamation yards and on internet auction sites - although extreme care must be exercised to avoid handling stolen boxes or modern replicas posing as authentic historic items. You should expect to pay several hundreds of pounds for any genuine box, possibly a lot more for older, rarer boxes. 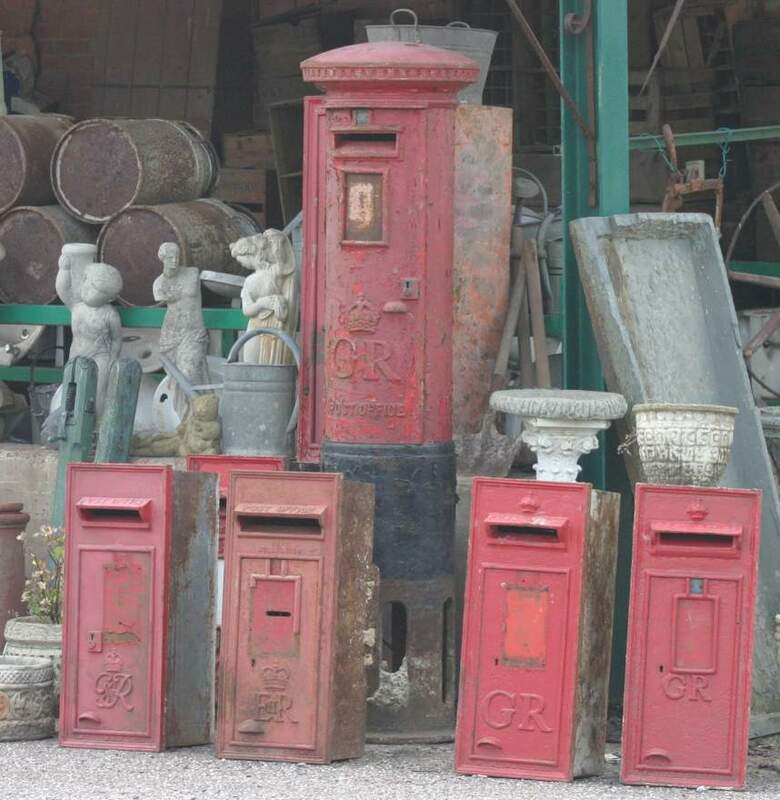 Over the past few years, more and more replica post boxes have appeared on the UK market. Some of these are appalling things that resemble nothing to be seen on our streets! They are often made from old gas bottles - easily spotted as the are far too narrow. However, fairly good copies in cast iron and sheet steel of the standard 1940 pattern lamp boxes are now commonplace. These are harder to spot. Look for GviR boxes with "Carron Company" on the door, or with four fixing lugs on the outer edges of the front casting. These are completely wrong for the period. The EiiR copy is much harder to tell apart. The real giveaway on all these copies is the circular barrel lock instead of the traditional Chubb five lever lock. The earlier "Hovis" top lamp box has also been copied and is sold in E7R, GR and VR versions. The lock comments above also apply to these and also there are two fixing screws beneath the aperture which should be flat head. On the copies, these are cross-heads. No crosshead screws in 1897! Always challenge the seller to prove that the box is genuinely old and not a copy. Solopark - East Anglia's foremost salvage yard ocassionally has boxes. Occasionally we dispose of postal-related items which are surplus to our needs. These may include collection plates, time tablets or other parts no longer required for restoration. In addition we stock an excellent range of quality enamel die-cut Fridge Magnets, Badges and Key rings depicting post boxes, telephone kiosks and otherstreet furniture. These are available by mail order. Click here to visit the Museum Shop.